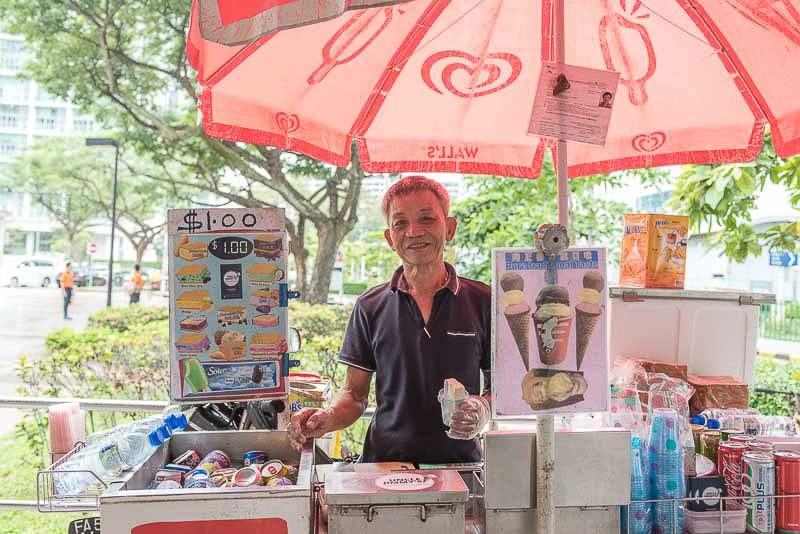 Ice cream uncles have always been an integral part of Singapore. They’re the ones children look for after a sweaty game with friends and they present a why-not treat (and a bit of nostalgia) for adults after a tiring workday. 72-year-old Jimmy Teng has been a mainstay in Lavender for several years. 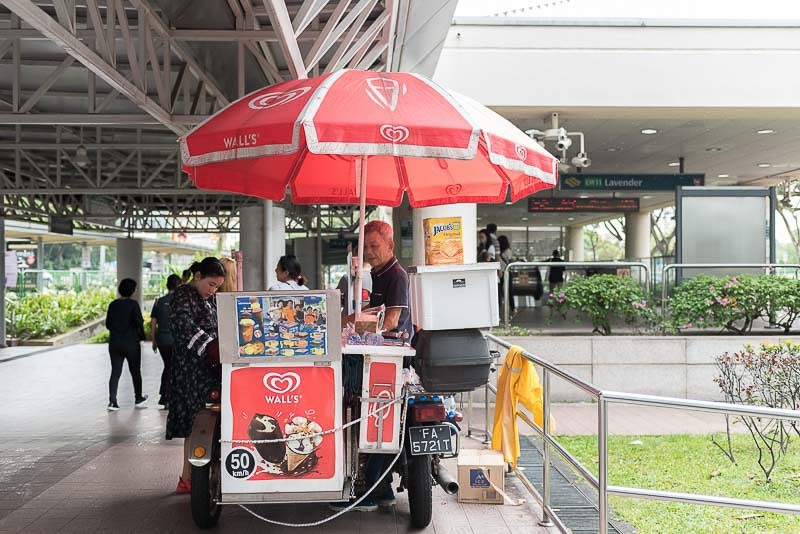 Better known as Uncle Jimmy, it’s hard to miss his ice cream cart, with its striking red umbrella, situated right outside the exit of Lavender MRT station. 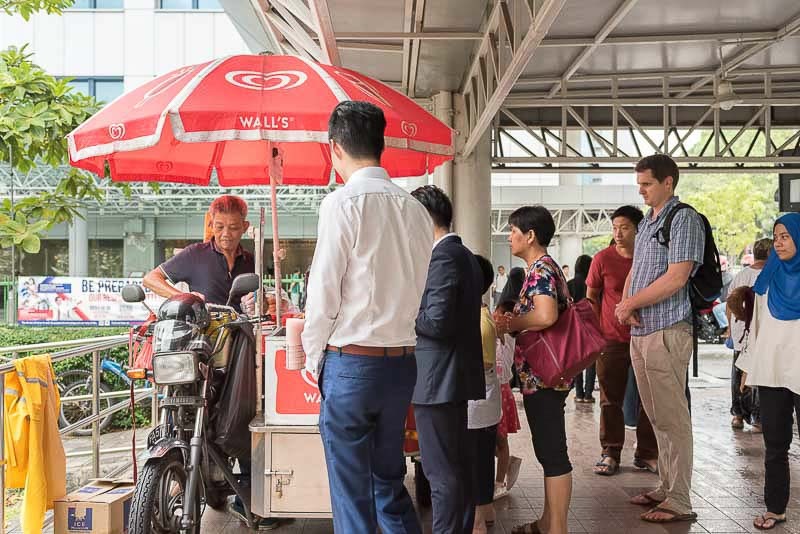 Though he’s a welcome sight every day, he’s especially popular every 22 March, as he doles out free ice cream all afternoon to celebrate his birthday. What’s more, he’s been doing this for three years straight! 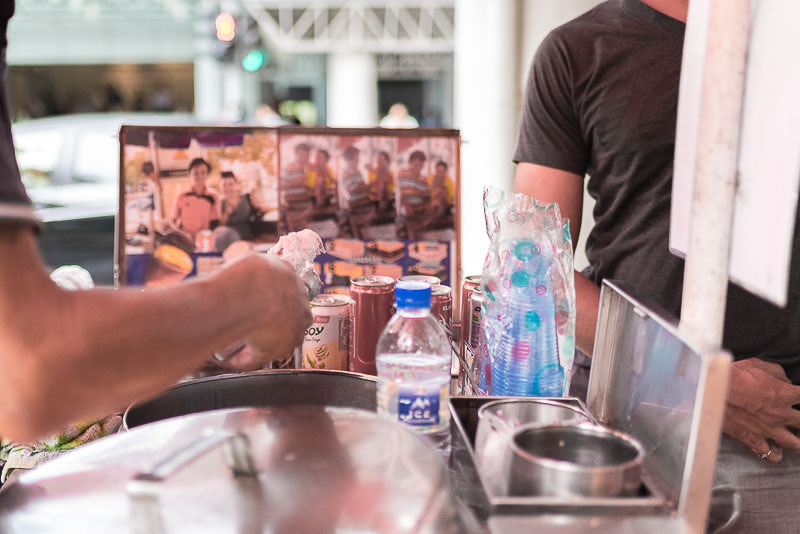 Uncle Jimmy started out as a street hawker and sold char kway teow until 1979, when he switched to driving a taxi after NEA imposed stricter laws regarding food hygiene. However, as time passed, his vision deteriorated such that his eyes were no longer as sharp at night, signalling the need for a career change. Initially, he contemplated working as a gardener but realised during the interview that it wasn’t feasible for a 60-year-old to lift heavy pots. 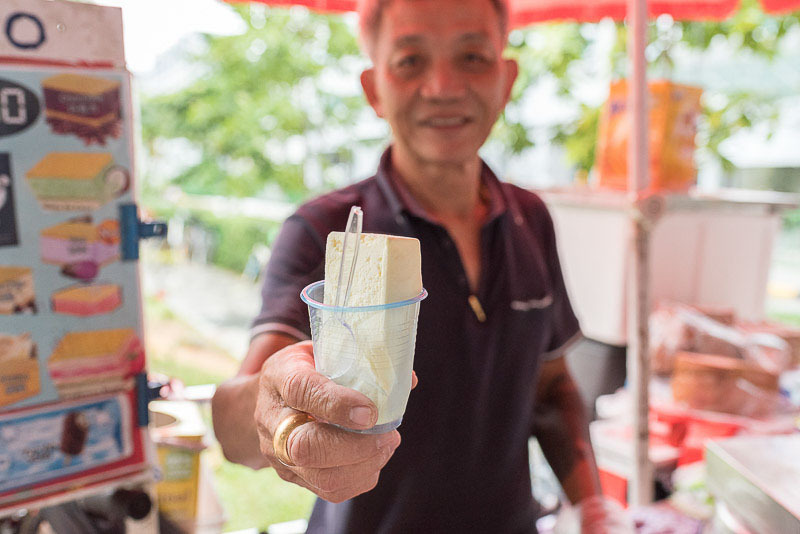 He heeded the interviewer’s suggestion to try applying for a license to sell ice cream instead and 15 years have passed since then. Uncle Jimmy “work[s] five days a week, Monday to Friday, 1 to 6pm.” From time to time, he takes days off when he finds himself getting too tired. When I visited Uncle Jimmy, it was a cold rainy day and yet business was still brisk. From couples to families, tourists to men decked out in formal wear — the cold weather did not deter anyone from getting a dose of refreshing sweetness. 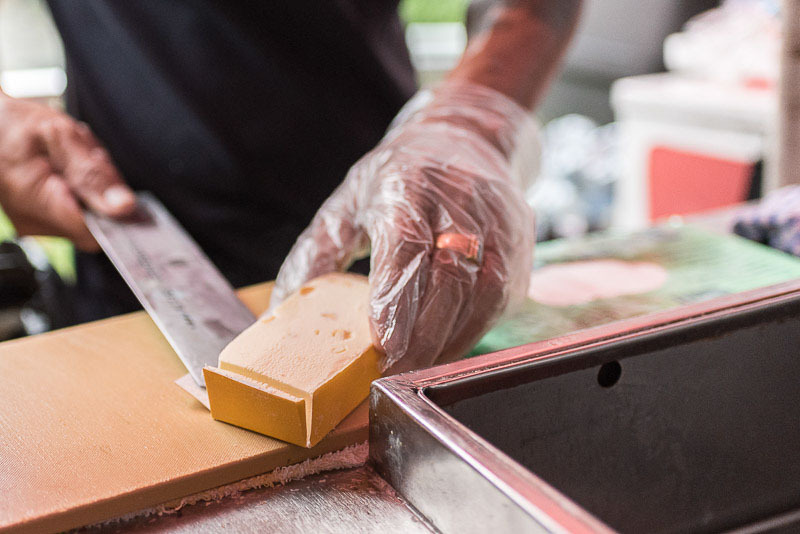 He shared that the best part of the job is getting to meet people from all walks of life, adding that he’s always enjoyed interacting with his customers. Even when he was a taxi driver, he often chose to drive to the airport to fetch tourists so that he could chat with them about Singapore. While watching Uncle Jimmy at work, I noticed that he has a soft spot for kids and is always quick to crack a smile or chuckle at their various antics. For instance, when a young boy who was particularly pleased with his ice cream chirped a happy “ooh la la!”, Uncle Jimmy echoed “ooh la la!” in response, the skin around his eyes crinkling as he beamed. If you happen to be ordering an ice cream from Uncle Jimmy, take a peek at the side of his cart where he’s put up several photos that he took with various Channel 8 actors/ actresses who have visited his cart! With his own Facebook page that has garnered over 7,000 likes, Uncle Jimmy may be regarded as a celebrity in his own right. The Facebook page was created with the help of a group of students from NUS when he was catering for their event. He was initially hesitant, saying that he didn’t “know about all these”, but they persisted, explaining that it was very easy to master. 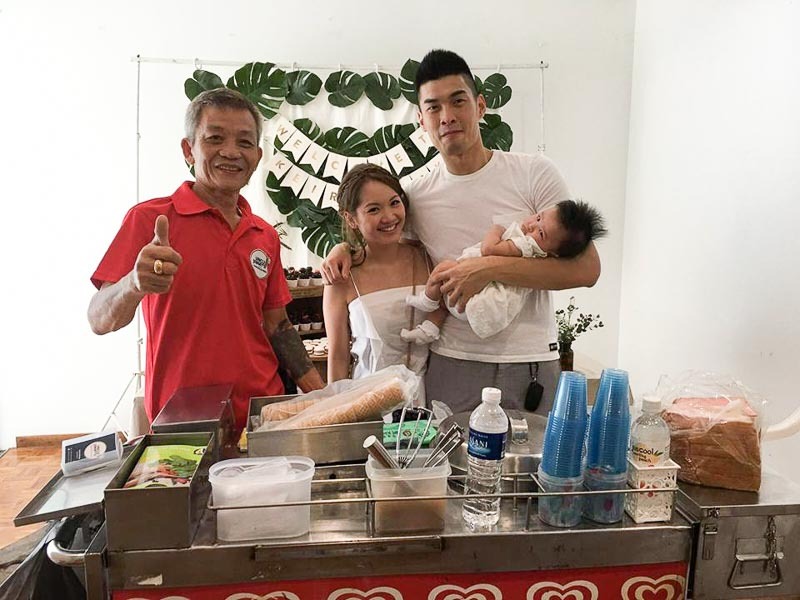 In order to keep up with the times, he started catering for events around three years ago after receiving requests to serve ice cream at open houses during New Year. The page now serves as a way for interested parties to reach out to him. In addition, he posts pictures of events he’s catered for and shares articles about his business. 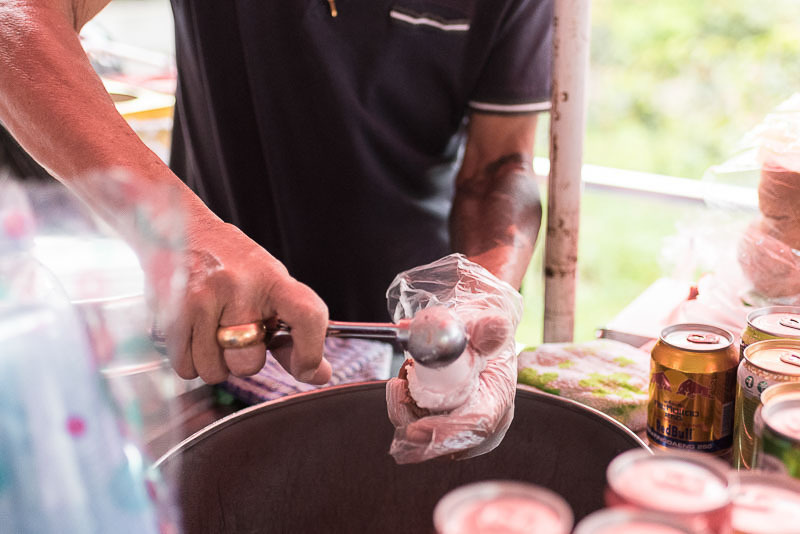 Despite the constant stream of people stopping by his ice cream cart, Uncle Jimmy shared that it’s still less busy now as compared to the past. When he first started out, there was “nothing here”. However, people can now opt for various other shops just across the street, like McDonald’s. 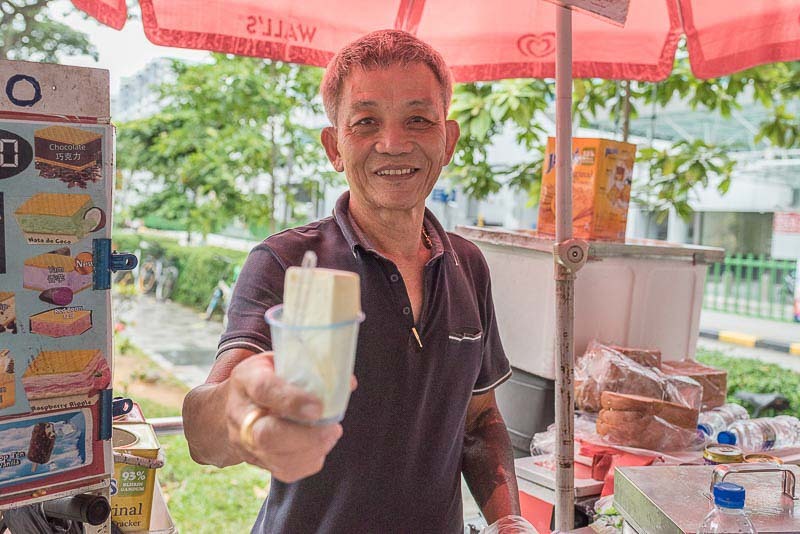 If you’re checking out his Facebook page, do give “Uncle Jimmy Traditional Ice Cream On Wheels” a like while you’re at it because it’s where he announces that he’ll be giving out free ice cream! It was actually Uncle Jimmy’s wife who first proposed the idea of giving out free ice cream on his birthday. However, he couldn’t carry it out back then as “all the money from my work went to her hospital bills”. “So after she passed away…”, he trailed off. He started by giving out 700 free ice creams during his 70th birthday and 1,000 free ice creams the following years. This is his third year of doing so and the response was so good that he was sold out by 5pm, despite initially planning to carry on till 6pm. While touched by his generous gesture, I couldn’t help but feel slightly concerned. “Don’t you feel like you’re making a huge loss?” I asked. “No lah,” he replied immediately, explaining that he always sees people looking very stressed and hopes to cheer them up a little. Uncle Jimmy acknowledged that it’s the “sunset days already”, referring to how ice cream uncles are a less common sight nowadays. Moreover, his family worries that he might over-exert himself with the long hours of standing up while working. His daughter often asks him to stop working and to take care of his grandchildren instead. However, he enjoys working too much to stop. Besides, many of his customers have turned into friends who are always looking out for him. For instance, after his wife passed away, he stayed at home for three months and his friends all encouraged him to return. He eventually did as he found it too boring to remain at home. Before I left him, I bought a slab of sweet corn ice cream and had it in a plastic cup, just the way Uncle Jimmy likes it. As I sat at the bus stop enjoying my ice cream, I mulled over his story. It was a cold and windy day, with raindrops pitter-pattering on the shelter overhead, but my heart felt warmed by his kindness. There’s something about the way he lives his life that we could all emulate – not by counting the pennies but the smiles.